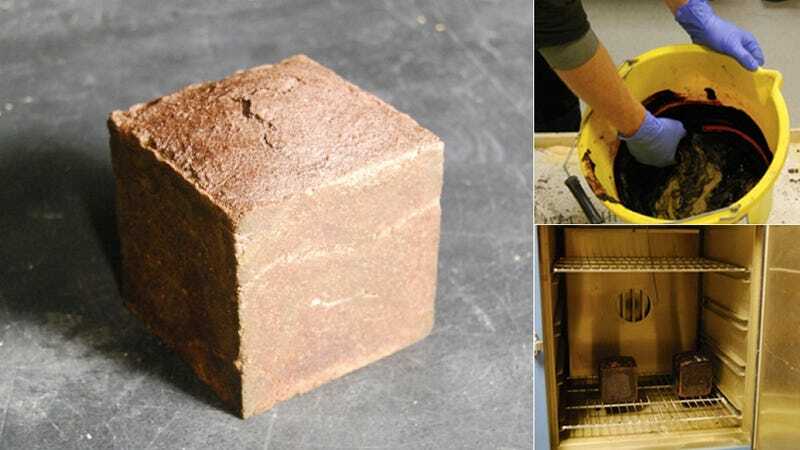 Are Blood Bricks the Future of Building? Take the blood of a freshly slaughtered animal. Mix thoroughly with preservatives and sand, pour into square molds, and bake for one hour. Allow to cool—then build your home from the result. No, really. Animal blood is one of the most prolific waste materials in the world. The blood drained from animal carcasses is generally thrown away or incinerated despite being a potentially useful product. The invented process involves mixing fresh blood with a preservative (EDTA, prevents bacterial / fungal growth on the material) and sand. This mixture was then placed in a form work and baked for 1 hour at 70 C. This application of heat is sufficient to coagulate the blood proteins into a solid insoluble mass which bonds the sand into a stable solid. The resulting material is cheap, surprisingly strong and waterproof. Because it's made of a prolific waste product—unless you eat a lot of boudin noir—it seems like a perfect building material for poorer countries around the world.